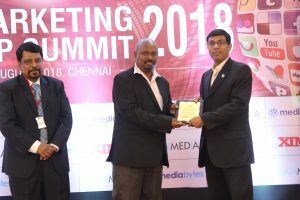 Digital Marketing Leadership Summit (DMLS) 2018 was held at Chennai. It had various topics in the digital economy, digital marketing for startups and small businesses, future of digital marketing, how should CMOs drive digital transformation initiatives, and others. Mr Shyam Sekar S, Founder and CEO of Startup Xperts, who is well known as a Startup Mentor and Digital Marketing Strategist, was invited as a Distinguished Speaker at this event. He was a Panelist in the panel discussion on ‘Driving Business Impact with Digital Marketing’. This was organized by XIME and Mediabytes. At this event, the 12 Business Leaders who were invited as speakers incl. Shyam Sekar S – Chief Mentor & Strategist, Startup Xperts, were recognized as ‘Distinguished Digital Leader’. Digital Technology has incredibly influenced our lives. Our communications, occupation, purchases and daily habits are all driven by what digital marketing brings to the table. Today, the customer journey is extremely convoluted as more than half of the of online adults start with an activity on one tool only to finish it on another. Reaching out to the target audience at the right time and through the right medium is a complex task for marketers because of the availability of a number of digital platforms.